The broken King Stone. The 19th (?) 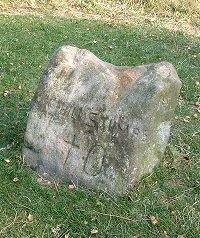 century graffiti reads - 'Bill Stumps' together with a cross (or a T) and a O underneath. Although this embanked stone circle is known as the Nine Ladies, there are in fact 10 stones here, a buried slab was discovered in 1979 and can be seen to the east of the circle, it is possible that there were originally even more. In keeping with many Derbyshire circles none of the stones are particularly tall and this ring has a diameter of about 10 metres - there is a faint trace of the outer bank and what may have been a small cairn or earth mound near the centre. It is thought that there were entrances to the northeast and southwest. Thirty five metres to the south west of the circle is the 'King Stone' a single graffiti covered stone that was once thought to be an outlier but which is now known to have formed part of a now destroyed ring cairn. The stone was once taller but was damaged in recent years after being hit by a vehicle. The first thing you'll notice when visiting the Nine Ladies is the pristine state of the turf, the result of recent renovations at the site which was rapidly turning into a quagmire due to the pressure of visitor numbers. The neatness and tidiness of the grass give the circle a bit of an artificial modern air but once the wild grasses and flowers have started seeding themselves in the new grass the place will look a lot more natural but it's already a huge improvement. The site could once have had good views to the north (Wye valley) and the east (Derwent valley), these views are now obscured by a small copse of trees.